Charles Augustus Lindbergh (February 4, 1902 – August 26, 1974), known as "Lucky Lindy" and "The Lone Eagle", was a pioneering United States airplane pilot. He became famous for making the first solo non-stop flight across the Atlantic Ocean in 1927. 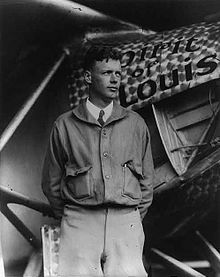 Lindbergh was born in Detroit, Michigan. His parents were Swedish immigrants. He grew up in Little Falls, Minnesota. His father, Charles August Lindbergh, was a lawyer and later a U.S. congressman, who was against the United States entering into World War I. His mother was a teacher. While he was young, he was interested in machines. In 1922 he joined a pilot training program with Nebraska Aircraft, bought his own airplane, and became a stunt pilot. In 1924, he started training as a pilot with the United States Army Air Corps. After finishing first in his class, Lindbergh took his first job as pilot of an airmail route in St. Louis. He flew the mail in an airplane. In April 1923, while visiting friends in Lake Village, Arkansas, Lindbergh made his first ever flight over Lake Village and Lake Chicot. Lindbergh gained fame around the world as the first pilot to fly solo (alone) and non-stop across the Atlantic Ocean. He flew from Roosevelt Airfield (Nassau County, Long Island), New York, USA to Paris, France on May 20-21, 1927 in his single-engine airplane The Spirit of St. Louis. He needed 33.5 hours for the trip. When he arrived back in the United States, many warships and aircraft escorted him to Washington, D.C. where President Calvin Coolidge gave him the Distinguished Flying Cross. Lindbergh's act won him the Orteig Prize, which was 25,000 US dollars. A parade was held for him on 5th Avenue in New York City on June 13, 1927. At the end of the year, he was named Time's first Man of the Year. He served on a variety of national and international boards and committees, including the central committee of the National Advisory Committee for Aeronautics in the United States. Lindbergh's Medal of Honor recognized that he had done something unique. This is one of only two medals given for conduct during peacetime. The words of Lindbergh's citation explain:. For displaying heroic courage and skill as a navigator, at the risk of his life, by his nonstop flight in his airplane, the "Spirit of St. Louis," from New York City to Paris, France, 20-21 May 1927, by which Capt. Lindbergh not only achieved the greatest individual triumph of any American citizen but demonstrated that travel across the ocean by aircraft was possible. Lindbergh married Anne Morrow in 1929. In 1932 he made headlines again, when his baby son, Charles Lindbergh III, was kidnapped and murdered. Bruno Hauptmann was convicted of the crime and later put to death in the electric chair. The Lindberghs later moved to Europe. He died of lymphoma on August 26, 1974 in Hawaii. Lindbergh is honored in aviation for mapping out polar air-routes, flying at high altitudes, and decreasing fuel use. Lindbergh's legacy is, in part, his unique solo flight which changed public opinion about the value and significance of aircraft and air travel. In greater part, his legacy developed from what he did with his status and fame. He used his celebrity to advance aviation across the world. A developing Lindbergh legacy is in life sciences. ↑ US Air Force, "Brig. Gen. Charles A. Lindbergh"; retrieved 2012-12-7. ↑ "Charles Lindbergh Medal Of Honor" at CharlesLindbergh.com; retrieved 2012-12-7. ↑ 3.0 3.1 Rayl, A.J.S. "A Lindbergh Legacy in Life Sciences," The Scientist (US). October 14, 2002; retrieved 2012-12-7. This page was last changed on 30 August 2017, at 23:01.